Fantasy Football Week 8 QB Rankings - Fantasy Football, Fantasy Football Rankings | Mac Bros.
1. Drew Brees (NO) – The only thing that could prevent him from rebounding from a disappointing week 7 performance this week is jet lag. Brees will take the Saints air show across the pond to London for a week 8 showdown against his former team, the San Diego Chargers. The Chargers currently claim the NFL’s worst pass defense allowing 255 passing yards per game. In addition, they have given up 11 TD’s through the air in just 7 games. 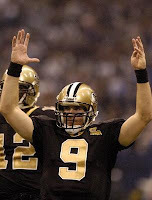 Brees has been waiting three long years to play the team that pre maturely gave up on him, and you can bet that he will be playing with a chip on his shoulder. 2. Donovan McNabb (PHI) – He hasn’t been as consistent as we would have liked to have seen to this point, but when the match up has been right, so has McNabb. It just so happens that week 8 offers an excellent match up. He will face a Falcons pass defense that ranks 26th in the NFL allowing 232 yards per game. They have also given up 10 TD’s through the air in 6 games. In addition, McNabb will have a full compliment of weapons at his disposal for the first time this season with the expected return of Brian Westbrook, Reggie Brown and Kevin Curtis from injury. He should be more than solid for your week 8 fantasy roster. 4. Phillip Rivers (SD) – He isn’t your most dependable fantasy option, but it’s hard to argue with his NFL leading 16 TD passes. The good news is that Rivers should be very dependable in week 8 against the Saints. New Orleans has struggled against opposing passing games throughout the season allowing 222 yards per game. The game will be played in London, so there could be some jet lag involved, but we still like Rivers’ chances to continue lighting up the score board with this match up. 5. Kurt Warner (ARI) – He will probably have all he can handle this week facing the Panthers 2nd ranked pass defense, but with Anquan Boldin back and the emergence of Steve Breaston, you still have to like his chances for another big fantasy performance in week 8. In spite of the difficult match up against Carolina, Warner remains a must start. 6. Matt Schaub (HOU) – As expected, Schaub was excellent in week 7, even if it was against lowly Detroit. While a week 8 match up against the Bengals 6th ranked pass defense will probably prove to be more challenging, Schaub is firing on all cylinders right now, and should come out on top. He is averaging 318 yards passing and has 7 TD’s (1 rushing) in his last 3 games. 7. Ben Roethlisberger (PIT) – Now that his shoulder is on the mend, Roethlisberger is starting to heat back up. In his last 2 games, he has thrown 5 TD passes to only 1 interception while averaging 263 passing yards per game. He will face the Giants 11th ranked pass defense in week 8. The match up is not ideal, but the Giants have been shakier than usual lately against the pass and Roethlisberger is as solid as ever. 8. Peyton Manning (IND) – After he torched the NFL’s top ranked pass defense in week 6, we all assumed that Manning would get back to business as usual with the Colts passing game. Unfortunately, reality struck in the form of a horrible week 7 performance against a beat up Green Bay secondary. As much as we wish we had an explanation for the melt down, there just isn’t one, and it now seems that Manning could be in for a Jekyll and Hyde type season. Manning will face division rival Tennessee in week 8. The Titans currently rank 5th in the NFL in pass defense and have allowed only 1 passing TD all season. The match up isn’t exactly promising, but you can never count him out against any opponent as you saw in week 6. 9. Jake Delhomme (CAR) – Based on his numbers to date, you probably can’t expect him to light up any defense, but Delhomme has had some solid games this season, including a 2 TD performance last week. In week 8, he will match up against the Cardinals 20th ranked pass defense. The Arizona pass defense, much like Delhomme, has been up and down throughout the season, but the fact that they are giving up 2 TD passes a game on average, certainly favors Delhomme. Don’t expect him to accumulate monster stats in week 8, but the match up bodes well. 10. Brett Favre (NYJ) – As big as his 6 TD performance in week 4 may have been, Favre is now on a short leash after back to back poor showings. In his last 2 games, he has 4 interceptions, 4 fumbles and only 1 passing TD. While we expect him to get back on track in week 8 against a middle of the road Kansas City pass defense, we don’t think it will be in a big way. The normally pass happy Jets will almost certainly rely heavily on the running game this week given the Chiefs ridiculous inability to stop opposing RB’s recently. Favre should rebound with a solid effort, but don’t expect a huge day. 11. Jeff Garcia (TB) – He should make for a solid start in week 8 against a beat up Dallas secondary. The Cowboys secondary has been mediocre this season even when healthy, but now that Terence Newman, Pac Man Jones, and Roy Williams are all sidelined, the Dallas pass defense is very inexperienced and extremely vulnerable. Garcia isn’t a flashy fantasy option, but if you are looking for a safe and efficient bye week fill in, he is definitely your guy. 12. Trent Edwards (BUF) – While he is better suited as a fantasy back up, Edwards continues to put up acceptable numbers on a weekly basis, and should provide fantasy owners with a quality stat line in week 8. He will face division rival Miami. The Dolphins currently rank a lowly 27th in pass defense and have allowed 9 passing TD’s through 6 games. Edwards’ best fantasy performance last season came against Miami as he threw for 4 TD’s against them. 13. J.T. O’Sullivan (SF) – To say that he has played poorly the last 2 weeks would be an understatement. He has been so bad that his starting status has even come into question, but when you look at his recent match ups, it is somewhat understandable. Fortunately, a week 8 match up against Seattle should be just what the doctor ordered. The Seahawks have been torched on a weekly basis throughout the season ranking 29th against the pass. In addition, they have allowed 10 TD passes through 6 games and only have 1 interception on the season which bodes well for the turnover happy O’Sullivan. He threw for 321 yards, 1 TD, and 0 interceptions while also rushing for 32 yards in a week 2 meeting against the Seahawks. O’Sullivan isn’t the safest fantasy start for week 8 given his recent play, but we like his chances to turn things around with this favorable match up. 14. Matt Cassel (NE) – Sure, he was golden in week 7 with a 3 TD performance, but when you consider that it came against one of the NFL’s worst pass defenses (Denver) without their best defensive back for most of the game, it was more like fool’s gold. Cassel has his moments, but we still aren’t sold on him as anything more than a bye week filler. He will face St. Louis in week 8. While the Rams rank in the bottom half of the NFL in pass defense, they have shown drastic improvement over the last 2 weeks. This match up holds promise, but don’t expect anything more than decent production from Cassel in week 8. 15. Eli Manning (NYG) – For whatever reason, Manning is resorting back to his old ways. Some weeks you love him and other weeks you want to kick yourself for starting him. The last 2 weeks have probably fallen under the latter category as Manning has failed to reach the 200 yard mark while throwing only 2 TD passes and 3 interceptions. He should get back on track sooner than later, but it probably won’t happen in week 8 against Pittsburgh. The Steelers currently boast the NFL’s top ranked defense against the pass. He will have a tough row to hoe with this match up, so if you have a better week 8 fantasy option at QB, use him. 16. David Garrard (JAX) – He still isn’t shredding opposing secondaries, but Garrard has been solid of late averaging 237 yards passing, 1 TD, and 0 interceptions over his last 3 games. He will have his work cut out for him in week 8 against an underrated Browns pass defense. Cleveland currently ranks 7th in the NFL against the pass and has 9 interceptions to only 5 TD passes allowed through 6 games. Don’t expect much from Garrard with this match up, but he is looking better as the season progresses. 17. Derek Anderson (CLE) – He managed to salvage an otherwise forgettable fantasy day with a late TD pass in week 7, but he obviously hasn’t turned the corner like we had hoped after a promising week 6 showing. Anderson should have an easier go of it in week 8 against a shaky Jaguar pass defense. Jacksonville has allowed 11 passing TD’s through 6 games this season and gives up 230 passing yards per game on average. Anderson is not a safe bet for your fantasy roster until he shows consistency, but the match up bodes well. 18. Chad Pennington (MIA) – Considering that Pennington was playing against a tough Ravens pass defense in week 7, his 295 yards and a TD were fairly impressive. It is hard to expect much from Pennington any week with a lack luster WR corps to work with, but he always manages decent production. Week 8 will provide a difficult match up against the Bills top 10 pass defense. Pennington will have his work cut out for him and don’t expect a big game, but he has proven worthy as a QB2 for almost any match up. 19. Brad Johnson (DAL) – He was about as bad as a QB can be in the first half of week 7 against the Rams, but he seemed to get better as the game progressed. That said, we still don’t highly recommend him for week 8 fantasy use. Johnson has plenty of quality weapons at his disposal, but Tampa Bay will probably challenge him even more than the Rams did last week. Johnson should only be used as an emergency fill in at best. 20. Marc Bulger (STL) – While the Rams offense is starting to turn the corner, Bulger is still far from safe as a quality fantasy option. It may start to click for him soon, but keep in mind that he hasn’t thrown for more than 184 yards and 1 TD in any game this season. Bulger has a shot at a decent stat line in week 8 against a mid level Patriots pass defense, but anything more would be a surprise. He still has a ways to go before you should consider him as anything more than a shaky bye week filler.